Last week I had to opportunity to visit Kraków, Poland. Our Water Innovations Alliance Foundation (WIAF) Co-founder, Mark Modzelewski is now living in Krakow. Beautiful city, tremendous dining and cutting edge technology. Breakfast at my hotel was a roomful of Engineers, Scientists and Financial Professionals from the US, Great Britain, Italy, Russia, France, Poland, Canada, Germany, Ukraine, Romania, Norway, Sweden and more. There are major global companies such as: CH2M, Google (Warsaw) and Cisco all with a footprint in Krakow. I visited two IoT companies located in Krakow: Estimote and Silvair. These companies are working with numerous manufacturers located in the US. Last month we concluded our Water 2.0 Digital Transformation for the Water Industry Conference on March 22nd in Washington DC. Our DC event dovetails with what is happening in the water industry in Europe. The presentations from our DC event specifically dealt with digital solutions to various water infrastructure problems. To view the speaker presentations, click on the presentation titles below. Reusing the 69% of Industrial Water Wasted in the U.S.
Harvey Kaye, Chairman of the Board, Zero Gravity Solutions, Inc. Please join our roster of Corporate Members. For further information, please contact Vincent Caprio vince@waterinnovations.org or 203-733-1949 to discuss. We encourage individuals interested in continuing our efforts to provide information in regard to emerging water technologies to become individual members of the WIAF. Click here to become a WIAF Individual Member. The annual Individual Membership fee is $150. This workshop is free and open to the public with registration on a first-come, first-served basis. The goal of this workshop is to obtain input from stakeholders – both those new to nanoscale science, engineering, and technology and those already familiar with these fields and with the NNI – regarding the vision for the second era of the National Nanotechnology Initiative, known as NNI 2.0. Participants will be invited to comment on key aspects of the 2016 NNI Strategic Plan. Topics covered may include future technical directions, implementation mechanisms, education and outreach activities, and approaches for promoting commercialization. WEBINAR: 2016 CDR: Don’t Despair; Get Prepared! Complimentary webinar presented by Bergeson & Campbell, P.C. Join us at our 15th Annual NanoBCA Conference. We will have leading experts from private industry who are commercializing nanomaterials. 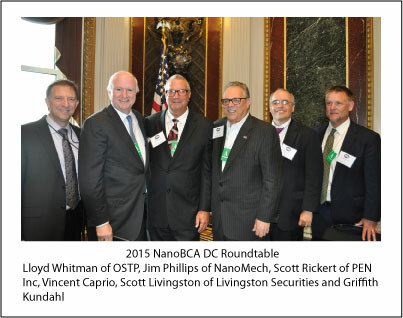 Nanotechnology leaders such as Jim Phillips, Chairman & CEO of NanoMech, Charles van Fleet, President of Swan Chemical, Doyle Edwards, Government Programs Director of Brewer Science, Dr. Matthew Putman, CEO of Nanotronics Imaging, Lynn L. Bergeson, Managing Partner of Bergeson & Campbell, Jess Jankowski, President & CEO of Nanophase and many more will be presenting at the event. For speaking opportunities or to attend, please email Vincent Caprio vincent@nanobca.org. Please join our roster of Corporate Members. For further information, please contact Vincent Caprio vincent@nanobca.org or 203-733-1949 to discuss. We encourage individuals interested in continuing our efforts to provide information in regard to emerging technologies to become Individual Members of the NanoBCA. Individual Membership includes participation on our monthly conference call. Our next call is on Thursday, May 26th at 2PM ET. Click here to become a NanoBCA Individual Member. The annual Individual Membership fee is $150. Looking forward to your participation in these dynamic events. You are currently browsing the Evolving Innovations weblog archives for May, 2016.